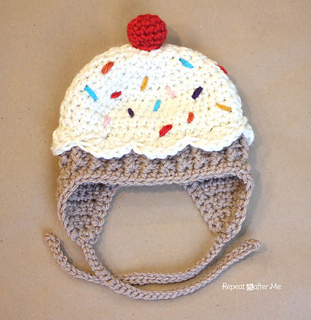 One of my good friends has a sweet 3 month old baby girl who sports the most adorable knitted cupcake hat. 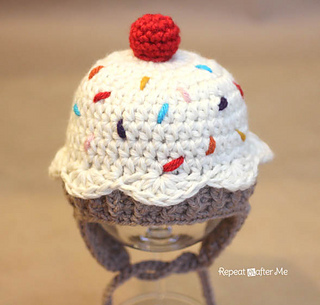 The second I saw it, I knew I had to make a crocheted version! I had the vision in my mind of how I was going to make it and am so excited that it turned out just how I had imagined it. But I am going to warn you, this hat takes longer to put together than most of my others. 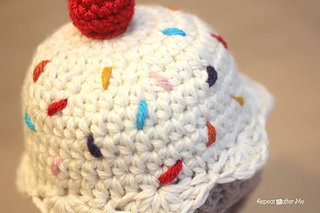 There are a lot of little embellishments and different stitches to make. Also, I am sure you guys were hoping for all sizes but unfortunately I only have the 0-3 month size worked up right now.